Remember Cinderella, Snow White, Sleeping Beauty and the countless other Disney classics of yesterday? Remember when you saw them for the first time how they made you smile? The films were pleasant and full of heart and were good, wholesome fun. Sadly, there hasn’t been a new Disney fairytale classic in too long a time – that is, until now. With Enchanted, Disney has returned to its roots of fairytale storytelling delivering an entertaining and delightful movie viewing experience. The tale begins in the land of Andonesia where the protagonist, Queen-to-be Giselle is cast from the animated world by Prince Edward’s wicked step-mother. Well aware that once Prince Edward marries Giselle she will no longer hold power, the evil Queen works her black magic to thrust Giselle into the real world; New York City to be exact. Confused, Giselle wanders the streets until a kind man and his daughter decide to help her. Now Price Edward, being the valiant one, goes forth to save his future wife… that is, if she doesn’t fall in love with the kind man she met in New York City instead. As mentioned above, Enchanted features a good amount of animation. The movie opens with a long scene in which Giselle and Prince Edward meet and transitions into the encounter with the evil step mother. The animation itself is beautiful – especially in pristine Blu-ray quality. Its nice to see new Disney animation; which makes me exited for their future 2D animation projects, including the 2009 release of The Princess and the Frog, Disney’s complete return to traditional animation. Giselle is played by the lovely Amy Adams, who’s acting is spot on for this role. To truly believe Giselle’s fairytale innocence, one has to believe in the actress portraying her. Amy Adams is perfect for this role and really brings Giselle to life. Rounding out the supporting cast members are Patrick Dempsey, James Marsden, Susan Sarandon, Timothy Spall, Idina Menzel and Nancy Tremaine. Narration is provided by living legend, Julie Andrews. Visually, the Blu-ray quality is superb with a great transfer. No film grain or noticeable artifacts are present. The film is presented in 1080p/AVC MPEG-4 with a resolution of 2.35:1. Sound wise, Enchanted features English Dolby TrueHD 5.1 Surround along with English, French and Spanish Dolby Digital 5.1 Surround. Subtitles are available in English, French and Spanish. Bonus features include a behind the scenes featurette that focuses on three of the musical numbers in the movie, deleted scenes, bloopers, a music video by Carrie Underwoord, a pop-up adventure and an interactive game. 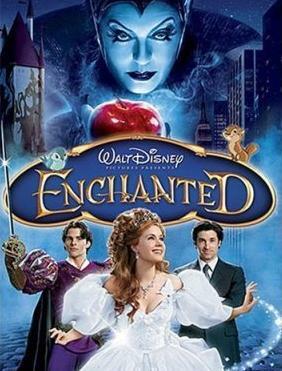 Overall, Enchanted is a sweet and charming instant classic that would make Walt Disney proud.